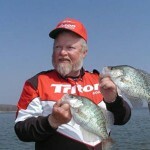 John’s Note: February’s cool-weather crappie fishing can be highly productive with plenty of fast action and big fish. Or, it may be as slow as pouring maple syrup out of a cold pot on a frosty morning. What makes the difference is where you find the crappie. 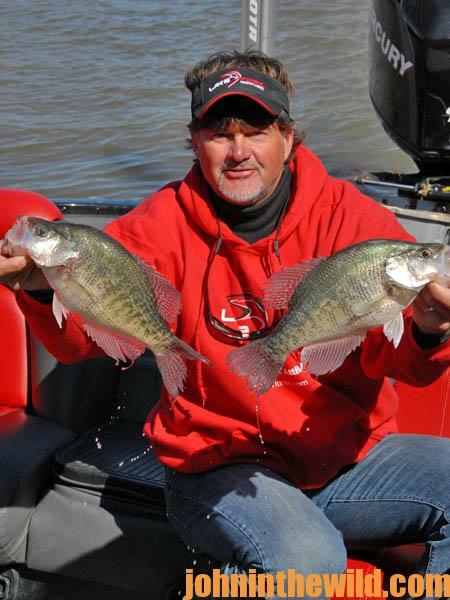 Let’s look at some ideal February crappie situations. 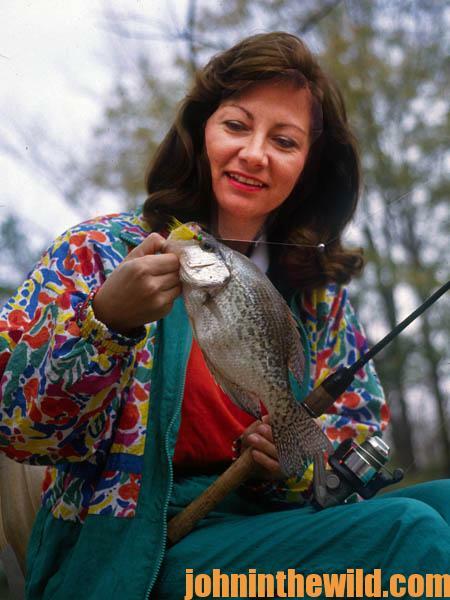 Most of us believe that crappie season begins with the announcement of spring when the woods appear as though they are covered with snow from the white blossoms of the dogwoods. I always have felt that proper crappie attire is tennis shoes with no socks, cut-off blue jeans, a t-shirt and a baseball cap. But one day I was in warm hunting boots and a snowmobile camo suit worn over a heavy pair of jeans, a wool shirt and thermal underwear. My catalytic heater provided the warmth I needed to relieve the aching in my fingers. Every now and then I stirred the water in the minnow bucket just to make sure it didn’t freeze. Deer season had been over for about a couple of weeks, while turkey season hadn’t yet begun. I wanted to catch a mess of fresh crappie for the skillet, although I realized I was some weeks away from the big spring crappie run. 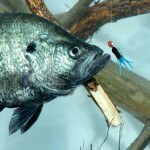 But, when you want to catch crappie, whether or not the time of year is right doesn’t really matter. My partner, Joe Alexander, and I already had fished several downed treetops and a good line of standing timber. Although we had taken 15 crappie, none of them were larger than three fingers. I would have been ashamed to put those small papermouths in the livewell, let alone the skillet. As we moved from one portion of the river to the other, we passed under a railroad trestle, the columns of which were facing the sun. We decided to test the water to see if there were some crappie in the region. Alexander and I set our cork sat different depths and began to drop-fish next to the piling. As quickly as my quill cork straightened up on the water, it sank. I set the hook, and the pole arched like a question mark. The fish was fighting so hard that at first I thought I might have caught a largemouth or a white bass that was holding close to the structure. But as the pole flexed its muscle, the bamboo responded, and the crappie came to the surface. The fish weighed over a pound and was the fist keeper we had caught. After rebaiting quickly, once more my cork never stood-up in the water but sank as soon as the line was taut. The crappie were holding in about 4 feet of water. Soon my partner shallowed-up his cork and started catching fish. We boated 15 crappie before the action waned. We fished a few other pilings that were in the shade but quickly decided that the pilings that faced the sun on that particular day produced the most crappie. Like many a nglers, I’ve found that crappie can be patterned just like bass. Once you locate the type of structure the crappie like to hold on, then if you can find that same kind of structure in another area, you reasonably can assume that crappie should be holding on that structure similar to the way they’ve been holding on the structure you’ve originally fished. Alexander and I left the trestle, went upriver and found a highway bridge where the pilings face the sun. Once more we took crappie in about 5 feet of water. We made two more stops that day and caught slabs off all the concrete structure we encountered that faced the sun. At lunchtime, we returned to our first trestle, caught 10-more crappie and began to run our concrete pattern again. But in the afternoon, we seemed to catch more crappie on the opposite side of the pilings that we had in the morning. Apparently, the fish were following the sun. As the concrete heated-up, the water was warmed. The fish chose the warmer water over the colder water every time. In cold weather, large concrete structures like bridge abutments, wing walls of locks and dams and railroad trestles absorb heat and then transfer that heat into the water to supply a comfortable environment for February crappie. Crappie move to creek channels, river channels and ledges to feed and find a warmer environment at those places when the water is cool. Most bridges and trestles have at least one concrete column just on the edge of an old creek or river channel that they cross. Naturally, as crappie migrate up and down that creek or river channel, they locate the warm water the concrete piling has caused and pinpoint the baitfish that are holding on that piling for warmth and food. The fish will tend to congregate on these particular pilings. 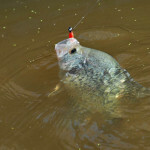 Although crappie will be on pilings further away from the creek channel, usually the pilings closest to the creek channel home the best crappie fishing during the colder months. But most of the crappie will be holding on the calm-water side of these concrete structures. 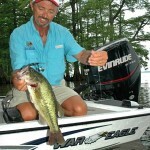 Once again, the fish will come to these areas for two reasons – the water is warmer, and the baitfish are abundant. One of the most-successful spots that I ever have found to catch early-season crappie is at the end of a wing wall. 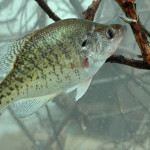 Crappie may be holding on the calm-water side at the end of a wing wall, so they can rest and feed out of the current. The current washing around the corner of the wing wall will sweep food right into the fish’s mouth. Sometimes an angler can limit-out fishing this type of concrete structure. Property owners may build small concrete walls or utilize broken pieces of concrete to break-up the currents near their lake or river homes. This broken concrete still has its heat-absorbing properties and provides a home for the microscopic organisms the baitfish like to eat. I have found some productive crappie hotspots on the backsides of concrete structures and rip-rap made of concrete. Although crappie will come to concrete for warmth and to feed, generally they won’t fight the current to stay warm and get a full belly of baitfish. 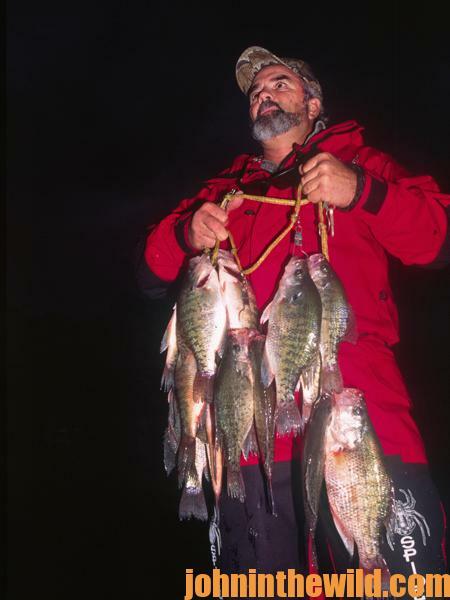 The largest number of crappie regularly will be taken on the calm-water side or the ends of the concrete structure where the water isn’t as swift.